Guess what's back? If you guessed Gumby, you're wrong. If you guessed #SmokedbyWindowsPhone, you're right. This time, trying to capture the man on the street format that Samsung successfully used with the Samsung GALAXY Note, Microsoft is trying to make the contest seem spontaneous which would be a way to refute those who call the entire promotion a gimmick and manipulated. The first video shows an Apple iPhone 4 owner names Rosslyn who loves social networking. So she is approached to take on a Windows Phone model. The challenge is to see who could be the first to post the word "movie" to both Facebook and LinkedIn. If Rosslyn wins, she's off to the movies with a dozen friends courtesy of Microsoft. 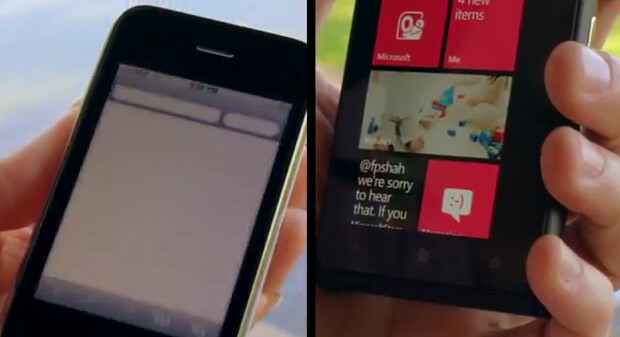 Of course, the Windows Phone spanks the Apple iPhone 4. How? Well, as it turns out, Windows Phone has a live tile that takes you to a page where you can post a message to multiple social networks at one time. Interesting how the challenge was a perfect fit for Windows Phone. Anyway, Rosslyn got a free Windows Phone and we can assume that her Apple iPhone 4 is now collecting dust on a bookshelf somewhere. The second challenge shows Dayna with her Apple iPhone 3GS This time, the challenge is to look for an American restaurant. If the Apple iPhone 3GS wins, dinner's on Bill Gates. Using the Windows Phone search button, Local Scout pops up and the challenge is over. Of course, had Dayna had the Apple iPhone 4S or an Android phone, she might have simply used Siri or Google Search. As it is, both mother and daughter receive their own Nokia Lumia 900 and free dinner for a week (not to mention having a creepy looking Windows Phone guy and his cameraman following them wherever they go). So guys, are these legit challenges? Is this a set-up? If you own an Android handset or an Apple iPhone, how could you have won the challenge? Don't be shy! Simply respond in the box below. It may be rigged but these people should be lucky that they get great WP handsets as opposed to iCrap. I'd rather have a brick than a windows phone. Complete POS!!! How is it a POS? Have you ever used one? It's great and smooth. A great OS in between Android and iOS. Easily, Im just going to compare it to a former windows product called Windows Mobile, which was killed off in favor of this. 1: No file explorer 2: No multi-tasking (as compared to WinMo) 3: No system Access 4: No customization 5: Single form factor 6: No outlook sync (unless you try the outlook-hotmail plugin which crashes your outlook constantly) 7: Does not play its (Windows) own WMA or WMV formats 8: Cant save to PDF 9: Cant save any files besides pictures and music 10: No actual file system and that is just to start out with!!!! If I wanted an iPhone, I would buy an iPhone, not a windows phone that immitates an iPhone. Yes, I am a WinMo fanboy, I have been using that platform for the last decade even before most people knew what smartphones were, but to go from WinMo to WP is a complete joke. And before anybody starts on the "have you ever tried one" excuse; Yes, I have purchased the HTC Radar 4G and tried the Lumia 900, however, besides the actual phones being nice, there is nothing good about the operating system that would keep me from comparing it to iOS. Any other questions I can answer for you??????? haha.. i don't know if you are really stupid or you are just stupid.. I'll take it, provided that my phone is older and cheaper (or an iOS device) than the WP.. It's an upgrade, why not? Only fools won't do that.. If the WP folks wanted to make it fair, they should let the guy with the non-WP phone call the challenge. Then we'd see how well WP does without a phone that's configured specifically to their canned challenges. What's that Microsoft? Not interested? Not surprised. I do have apps that can post to multiple social networks at the same time on my phone. I can do Twitter and FB at the same time. Not very useful as I generally need more characters than Twitter allows when posting to FB. The search for a restaurant is valid, but I do it so rarely that if pressed to do it quickly on the fly, I would have to think about which app to use. I have used Poynt on occasion, but it isn't on my home screen as I rarely need to do such a search for a restaurant. I do agree that the challenge is unfair. Having the person with the non-WP phone issue a counter challenge would make it fair. Also, giving both phones to people who have never used either would also be fair. I personally configure my phone to do the things I do most often. For instance, if I challenge the WP guy to bring up the latest scores in the CFL, I doubt that he would be able to beat me because I have a widget specifically configured to do that. Of course the challenges are "set up" to show the strengths of WP but the point is when it comes to everyday tasks, WP is better...most of the time. I post messages to Twitter and Facebook all the time. yeah, where's that old Samsung Corby? may I challenge you for a basic task of sending a file through bluetooth? well? Alright you got me, probably not one of the best examples to bet on but I do have a custom lock screen that has music controls on it at all times. Comparing 2009 iPhone 3GS to 2012 WP7. Way to go! They should have a challenge to see which phone (android, iOS or WP 7.5) can update to WP 8 the fastest. It would be a tie. When balmer said no existing phones can be upgraded to wp8, I'm betting nokia felt like they got smoked by windows phone.